The story of Embraer's EMB-312 turboprop trainer, the first aircraft in its class and a market leader that was sold to 16 countries and produced under licence in the United Kingdom. Comprehensive details are provided of local and foreign service, combat operations, as well as a full inventory of EMB-312 units and insignia. 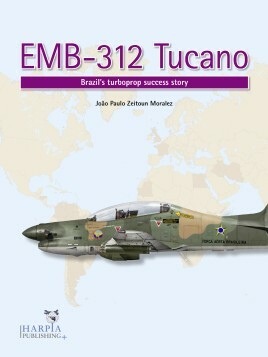 Harpia Publishing is proud to announce the launch of a new title for 2017, EMB-312 Tucano: Brazil’s turboprop success story, set to become the definitive English-language reference work on this revolutionary Latin American aerospace product. Written by an expert in the field, this book recounts the story of Embraer’s EMB-312 turboprop trainer, the first aircraft in its class to offer a cockpit and controls equivalent to its fighter contemporaries, as well enough power to match the high-speed maneuvers of comparable jet trainers. "Illuminating, informative commentary by prominent program participants add pungent perspective to details of aircraft origins and operations. And exciting, intriguing action accounts further flavor Moralez's saga... Buy this brilliant book. Then line-up behind me for Harpia's Super Tucano sequel. Rabidly recommended!" "This book describes the success story of the EMB Tucano and is a joy to read as well as a marvelous photo book showing the Tucano in all its executions and paintings that were used by the different air forces it served. - 5 stars"